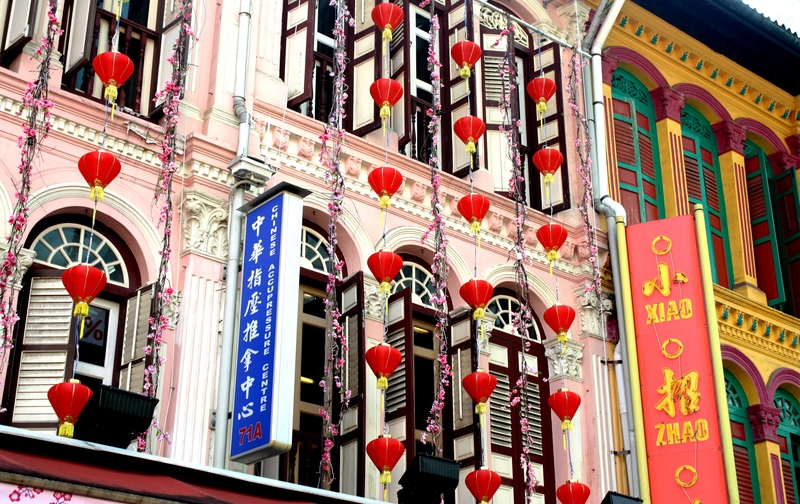 The most hotly anticipated cultural feast in Singapore is without a doubt Chinese New Year. As approximately 80% of the population is made up of ethnic Chinese, expect a roaring celebration steeped in traditions lasting for weeks. After years of travelling to the Lion city, I finally had the opportunity to immerse myself in the biggest and most significant event of the year.The festival usually starts on the first day of the month in the Chinese calendar and ends on the 15th day. Chinese New Year is not only a public celebration, but it also brings people like family and friends together for reunion dinners, accompanied by various offerings. 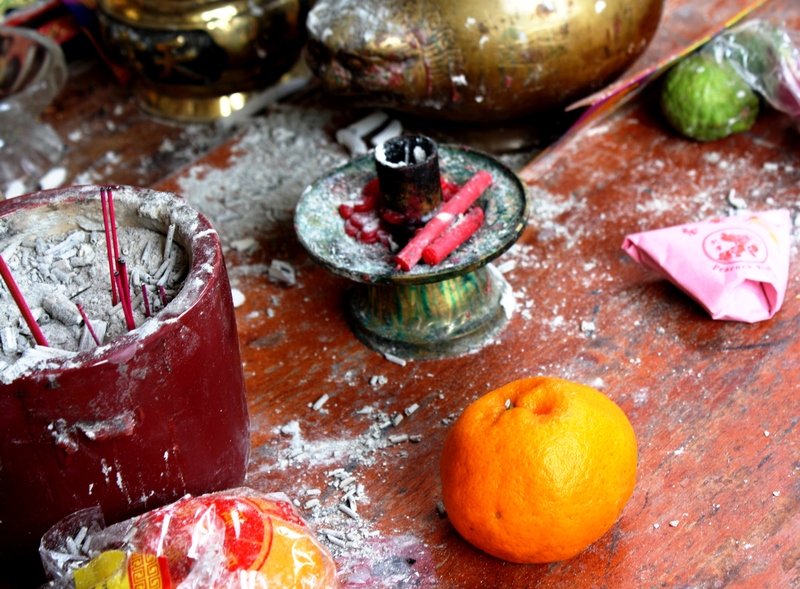 Symbolically, houses are cleaned to get rid of any ill fortune and make way for good luck. The Chinese are great believers in prosperity and financial advancement, so make sure, when visiting a Chinese family during the Lunar New Year, to bring two oranges symbolising gold and thus wealth, you will end up leaving with even more oranges yourself. Now the money will surely start to roll in. If you’re a single Chinese female, ‘t is the season to go shopping, because you will traditionally receive little red envelopes containing an “ang pow” a.k.a. money, left, right and centre. This year marks the year of the goat (or sheep), but the dragon was roaring its head all across Singapore when I was there, with Chinatown as the centre of all celebrations. Most of Chinatown is very gentrified, a touristic version of what a Chinatown should look like. 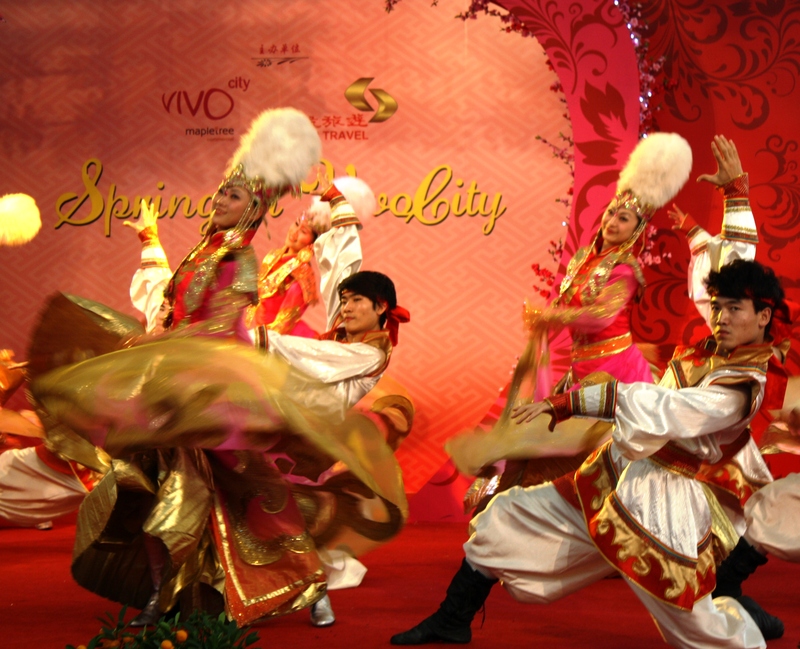 It ticks of all the boxes for those seeking a ‘civil’ way to enjoy Chinese culture. 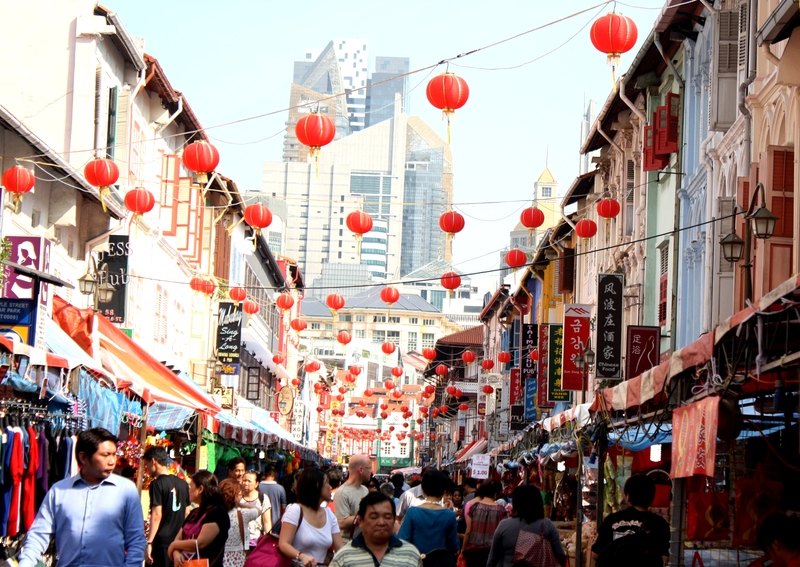 If you make your way to the back streets of Singapore’s Chinatown though, you’ll find true authentic Chinese culture and cuisine in the form of a big food centre, also known as a hawker centre, as well as a row of quirky little restaurants. During Chinese New Year, the whole area is brimming with action. Market stalls selling everything from weird looking dried fruits to sweets, oranges and the like, are littered all along the streets and the crowds draw in like nobody’s business. On the eve of Chinese New Year, spectacular fireworks are expected. However, as I stood there, huddled in the rain, clutching onto an umbrella, while the flood gates opened, I was unsure the New Year was going to receive the kick-off it deserved. It was still rainy season after all. True to form, thunder set in and the fireworks lasted a mere ten minutes. Now, as Singapore is known as Asia’s food capital, one cannot leave the isle without at least devouring one or more yusheng meals. In the Chinese custom, this seven-coloured dish, is to be eaten on, or from, the seventh day of Chinese New Year. 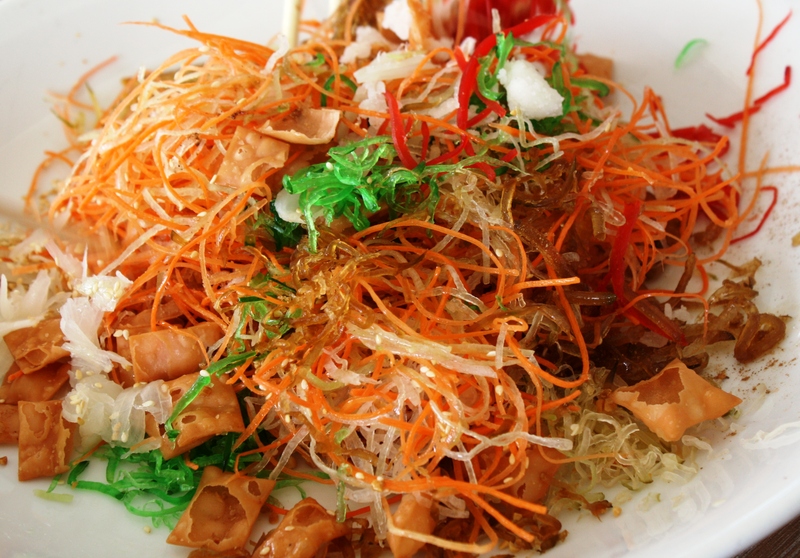 In Singapore the dish is a colourful mix of salad with raw fish slices. The dish is then topped off with crispy cracker bits, representing money, as yusheng is viewed as a symbol of prosperity and abundance. Although a bit too sweet, I quite enjoyed my yusheng meals, that is, until I was onto my fourth one. Although quick to pick out all the crispy crackers for good fortune of course. So in a country where economic prosperity and meritocracy are founding principles, it may come as no surprise that the prosperous, wealth seeking customs of Chinese New Year are brought to the fore. However, Singapore manages to retain all the cultural customs that are a true part of Chinese New Year and make it one of the most exciting times to be in the Lion city.